Branch told those attending an election forum on Sept. 15 that he opposes the amendment because it takes control of schools away from the local elected and appointed officials. Odom, in a pair of article in The Oconee Enterprise, also objected to the amendment because it takes control away from local leaders, but he outlined in addition a series of objections to administration of the Opportunity School District and the criteria used for designating schools as failing. The Opportunity School District amendment is one of four on the ballot. As of the end of the day today (Monday), 582 voters had cast their ballots in the first day of early voting, representing 2.1 percent of the 27,845 eligible voters in the county. “I’m a firm believer, and I believe our Board is as well, that we need to try to make as many decisions locally as possible,” he said. The video of his response to a question on the Amendment is below. OCO: Branch on Opportunity School District Amendment from Lee Becker on Vimeo. The amendment would allow the governor to create a statewide school district to administer schools determined to be failing. The governor would appoint a superintendent over the Opportunity School District. BOE Chair Odom is opposed to the the state’s ability to take local tax money and even use local facilities to operate the seized schools. He also objects to the way the state would determine which schools are failing, based on Georgia’s College and Career Ready Performance Index. He also is critical of the way the Amendment is presented to voters. In fact, it takes control of the schools away from the local community. Amendment 2 on the ballot would create a fund to provide services for child victims. Monies would come from fines for sexual exploitation crimes and from fees on adult entertainment businesses. Amendment 3 would replace the independent judicial qualification commission with one appointed by the governor and top legislative leaders. Amendment 4 would dedicate revenues from existing taxes on fireworks to trauma care, fire services and public safety. These ballot items accompany the renewal question for the Oconee County Education Special Purpose Local Option Sales Tax and the two Oconee County referenda on Sunday sales of alcohol. 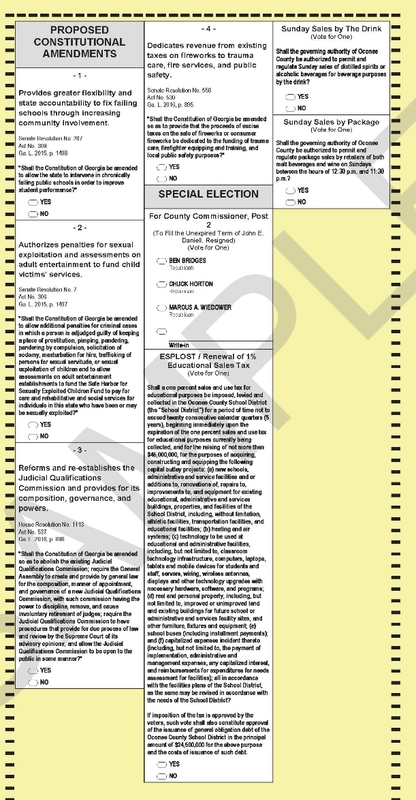 The special Board of Commissioners election to fill the unexpired Post 2 term appears on the ballot surrounded by these amendments and ballot questions. 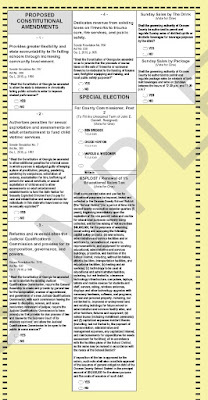 The second part of the sample ballot, containing the amendments and referenda, is below. I also have created a new channel on the Oconee County Observations Vimeo site for the videos I and colleagues Sarah Bell and Ann Hollifield have recorded of interviews and forums related to the November election. My friends and I have Vote No on Amendment #! sign on our lawns. Funny how our conservative Board of Education is opposed to the proposed amendment from our conservative governor. This is a pure power grab by Nathan Deal to give big $$ contracts to for-profit school national companies. Interesting to see such a high profile Republican intramural battle. The amendment clearly and specifically is designed to repair FAILING schools. Why the most highly paid official in a fortunate county with very successful schools has a problem with state help for failing schools is a mystery. The state plan is to increase state oversight to involve the community is some manner with appropriate study and evaluation. While I am skeptical that a failing school is not somehow paired with a failing community, the usual polemic that the Governor and state school system is involved in some kind of Orwellian power grab is ludicrous. To deny failing schools the assistance and pockets to improve is an ideology-based denial of reality. Vote FOR this plan to intervene in a school which has demonstrated an inability to operate with success. Once again the education establishment lines up to defeat a proposal to help children in failing schools. We can count on opposition anytime there is a proposal to make the education establishment accountable. Ask the people in some of the schools around the state with horrendous results how that local control is working out for them. Just the threat of state control has improved poor schools is states where it has been implemented. More money poured into these failing schools just increases the cost of failure. It makes me sick to see the education establishment lining up to defend ongoing failure. The proposed “fix” for failing schools (and remember Republican Sonny Perdue dramatically cut school funding) is to eliminate local control and insert a state appointed leader. The appointed education czar would be able to hire and fire teachers, allocate resources, set curriculum and enforce school discipline, ALL without public oversight or accountability. These school takeovers also allow the state to commandeer all of the school’s resources — taxpayer funding, school buildings, land and equipment. The state can do whatever it wants, including giving these resources over to the Georgia Department of Education Office of School Improvement’s beneficiary of choice: for-profit charter schools. Worst part of this power grab: Decisions made by these political appointees can never be appealed!! Louisiana had such a system in place for ten years...didn't work and now they're dropping it. We currently have a state Education department that could help failing schools if the department had adequate resources. This amendment just adds another layer of bureaucracy and increases our taxpayer costs. It is interesting that people say they want less government, but if they vote for this amendment, they are for increasing state government. Makes no sense to me. Also, note amendment 3, which replaces an INDEPENDENT judicial oversight board with one appointed by the governor. If you are concerned about ethics, vote NO on this one. This one is actually potentially more damaging to this state than amendment 1. Throw all the money and or bureaucracy you want at the failing school systems and nothing will change until you change the culture of the community the kids come from. "IF Mama don't read then the kids don't read". When kids grow up in an atmosphere of not knowing how to achieve before they are of school age, there is little chance of advancement and very difficult to climb out of that hole. When teachers are forced to teach the test in order to meet the demand of improvement within the system the kids lose the benefit of thinking for themselves and become parrots regurgitating the test not understanding anything outside of the test and find it hard to function and follow the rules of society.